A new study shows that a twice-daily treatment of lidose-isotretinoin administered without food is associated with decreased lesions and condition severity in patients with nodular acne. In new data presented at the American Academy of Dermatology (AAD) 2019 Annual Meeting in Washington, DC, this week, investigators Andrea Zaenglein, MD, and James Del Rosso, DO, showed that common acne therapy isotretinoin was associated with significant and sustained improvements to symptoms and metrics for quality of life (QoL). Isotretinoin was first approved as a therapy for acne by the US Food and Drug Administration (FDA) in 1982. For the past couple decades, it has been available in the US in various generic forms, and has been marketed as a combination therapy with erythromycin since 2017. Investigators noted the therapy has been previously linked to great improvements in the QoL of patients with nodular acne, though requires administration alongside a high-fat meal to achieve its optimal rate of absorption. Patients who do not comply with these requirements for food intake could compromise isotretinoin’s long-term efficacy. That said, lidose-isotretinoin absorption has been shown to be less dependent on dosing rates and food intake. A previous phase 4, multi-center, open-label, single-arm assessment of lidose-isotretinoin without food intake show acne patients improved in lesion counts and Investigator’s Global Assessment (IGA) scores, as well as in QoL assessments during the active treatment period. To assess its continued efficacy, the pair of investigators evaluated the long-term results of patient QoL during the 104-week post-treatment period of the phase 4 trial. The assessment included an initial 20-week treatment period prior to the 104-week post observation. Patients included in the study were aged 12-45 years old, with body weight between 40-110 kg. They had recalcitrant acne severe enough to be considered for isotretinoin treatment, and no prior exposure to systemic isotretinoin or any other systemic retinoid. The treatment was self-administered, with patients not eating 1 hour before or at least 2 hours after administering. They initially received 0.5 mg/kg/day, divided into 2 daily doses, for the first 4 weeks. Afterward, their treatment was upped to 1 mg/kg/day. Even if patients had not achieved IGA scores of 0, continued lidose-isotretinoin therapy was not permitted beyond week 20. A total of 197 patients constituted the intent-to-treat population. Of those, 163 completed an end of treatment assessment, and 119 completed an assessment at their final visit. Investigators reported that mean patient total lesions were significantly reduced from baseline to end of treatment (73.9 vs 8.4; P < .0001), and maintained during the post-treatment period (12.5; P < .0001). Mean IGA score similarly reported reduction from baseline to treatment period (4.2 vs 1.1; P < .0001) and sustained success through post-treatment period (1.2; P < .0001). Mean total Acne-QoL scores significantly improved from baseline to the treatment period (61.5 vs 99.2; P < .0001) and were sustained through post-treatment (103.2; P < .0001). Each of the 4 Acne-QoL domains—self-perception, role-emotional, role-social, and acne symptoms—similarly improved and showed sustain over the observed period. Investigators noted that treatments observed as early as week 4 of the treatment period—prior to the regimen increase—were maintained over the next 120 weeks. “Twice-daily dosing of lidose-isotretinoin administered without food decreased mean lesion counts and mean IGA scores between baseline and EOT, and this decrement was sustained to the EOS, demonstrating long-term efficacy of the dosing regimen,” they concluded. 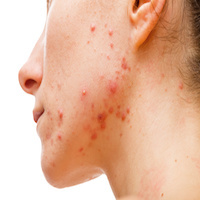 The study, “Quality of Life and Acne Severity in the Post-treatment Period of an Open-Label Study Evaluating Lidose-Isotretinoin Without Food for Treatment of Recalcitrant Acne,” was presented at AAD 2019.